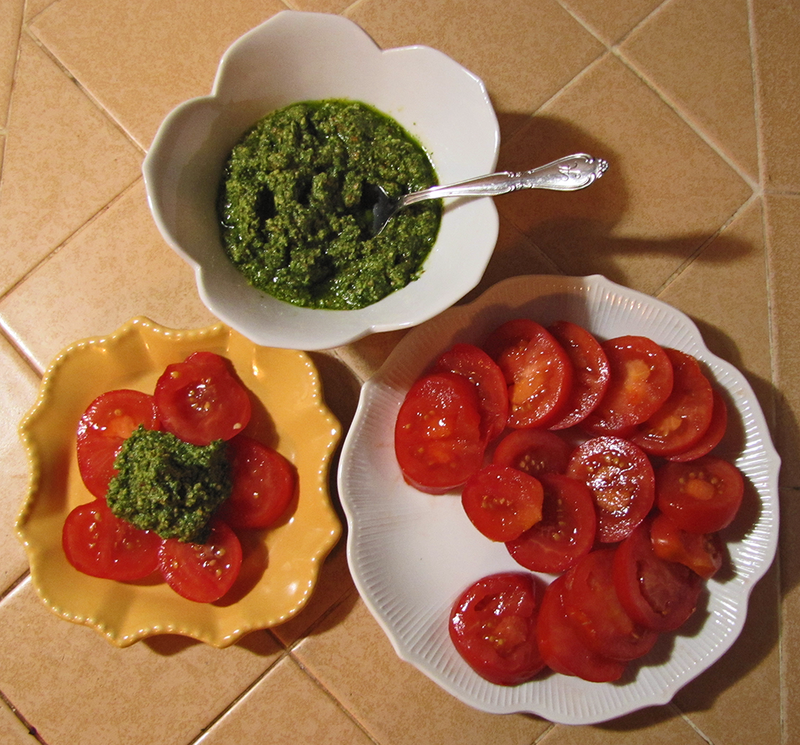 Finally a vegan pesto, with no cheese whatsoever, and not much oil! Made with cilantro and almonds instead of basil and pine nuts, this seems more Cali-Mexican than Italian. It’s from the cookbook If it Makes You Healthy: More Than 100 Delicious Recipes Inspired by the Seasons by Sheryl Crow, her chef Chuck White, and Mary Goodbody who probably did most of the writing and editing. Sheryl’s seasons are a bit different than most of ours because she tours in summer, and when she’s on the road Chef Chuck cooks her gourmet meals from healthy local foods, sometimes with extravagant ingredients like an entire bottle of wine. In autumn and winter, Sheryl is at home near Nashville, cooking simpler fare for her children. I’ve noticed that in different bunches of cilantro the proportion of cilantro leaves to stems varies wildly. The first time we made this recipe, one bunch of cilantro made a half-recipe, and the second time, one bunch made a whole recipe. 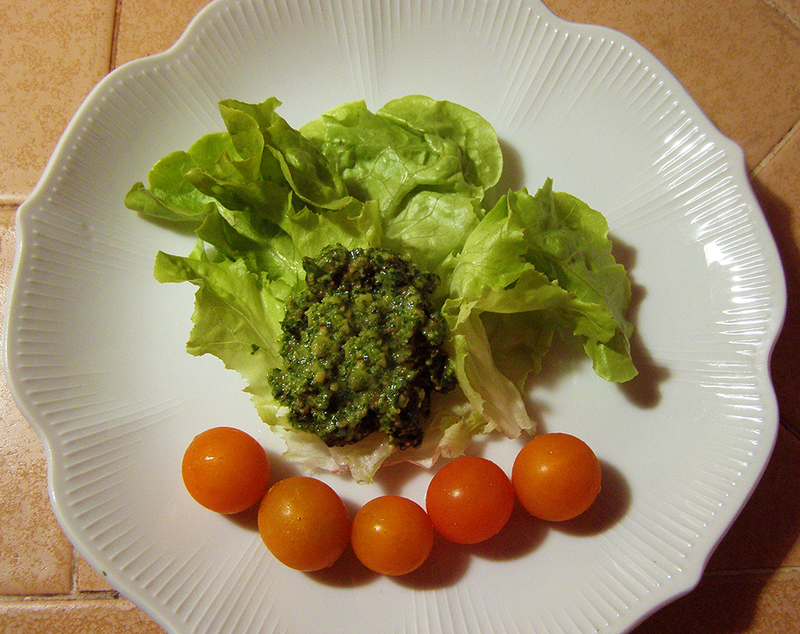 So use the cup-equivalent, 2 – 3 cups cilantro loosely packed, as your guideline. If you have fewer leaves, adjust your other ingredients proportionally. We substituted lime for lemon, since we had sliced lime on hand. 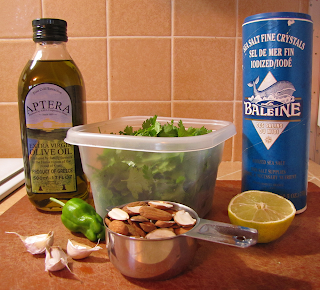 It tasted considerably saltier with lime than lemon, so I’d reduce the salt by half if you use lime. In fact, I’d reduce the salt next time even with lemon. The recipe calls for sliced toasted almonds. We sliced whole almonds in half and toasted them in a stainless steel pan. Also, we didn’t have a jalapeno, so we used a large padrone pepper, which unfortunately was not very spicy (some large padrones are, some aren’t.) So we added 1/8 tsp. of hot chili oil to mimic the jalapeno and zap up the pesto. 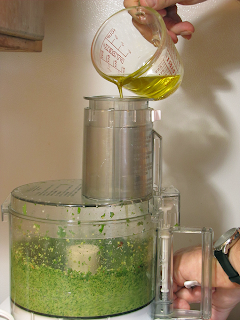 This pesto is quite thick if you add the minimum amount of oil, like we did. You can split and toast your own almonds. 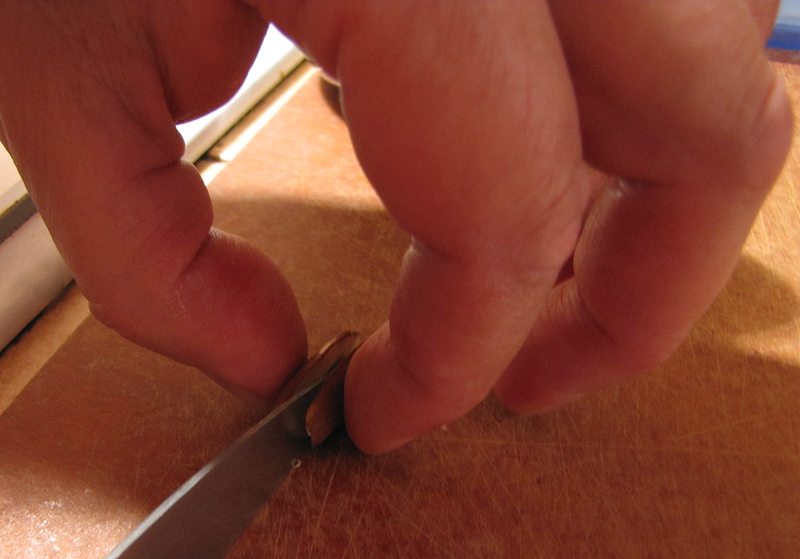 You’ll need a sharp knife (a fillet knife works best) and the ability to hold an almond tightly between your forefinger and thumb, and/or small fingers. Slowly saw and press the knife to split almond in half. Then toast in a steel frying pan over medium high heat for a few minutes, turning over to toast both sides. Cool before adding to other ingredients. Put cilantro, almonds, lemon juice, garlic, jalapeno and salt into food processor and process until almost smooth. Drizzle half of the olive oil through the feed tube and blend. Scrape down and add remaining oil through the feed tube as you process to the desired consistency. Enjoy on tomatoes, salmon, salad, or make up your own ideas. This might be good on tacos and burritos, or even in quesadillas.